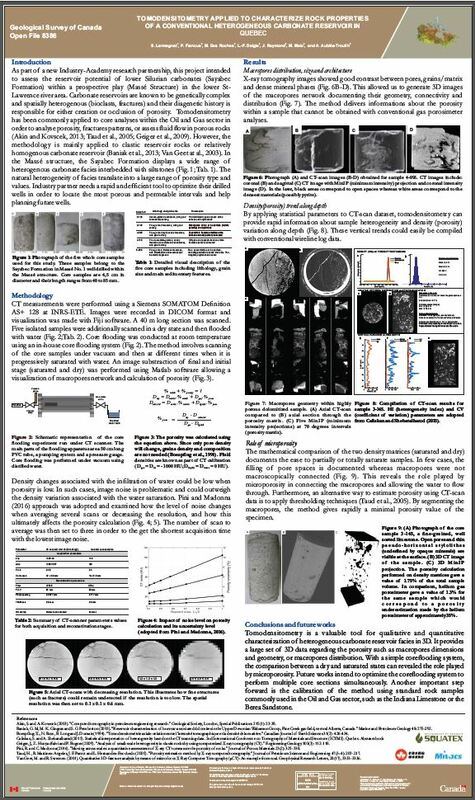 This poster presents the development a new methodology based on tomodensitometry to better understand reservoir properties of heterogeneous carbonates rocks, such as reefal facies, breccias or fractured and dolomitized facies. In the St. Lawrence River area, industry partner identified a prospective play in Silurian carbonates and need to better understand spatial distribution of porosity and permeability within these complex and heterogenous carbonate lithofacies. This work is part of a collaborative research partnership between Industry, Academy and the federal government (Environmental Geoscience Program).